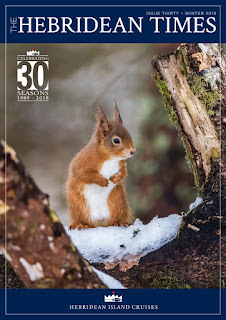 As our 30th anniversary season draws to a close, I should like to take this opportunity to update you with all the latest news from Hebridean Island Cruises and on board your favourite cruise ship, Hebridean Princess, by inviting you to read the 30th issue of The Hebridean Times here online. In this edition, Captain Richard Heaton shares with us some of his highlights of this season and our Meet the Team article features Purser Doreen Thomson. Our crossword competition offers whisky lovers the chance to win one of two fantastic prizes, a set of Glencairn glasses and crystal jug, together with a bottle of our own blend malt. As we look forward to next season, it is still possible for you to relive any cruise this year by reading our popular cruise logs. All the Hebridean Princess cruise logs from the last three seasons can be found by >>clicking here<< allowing you to enjoy a virtual voyage of relaxation and discovery. With next years cruises selling quickly and a number of itineraries already fully booked, please call Jonathan, Lisa, Louise, Stella or Abigail on 01756 704704 without delay to avoid disappointment. With very best wishes for a wonderful festive period.